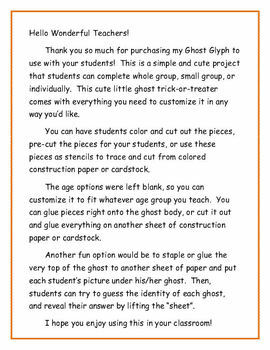 This is a simple and cute project that students can complete whole group, small group, or individually. 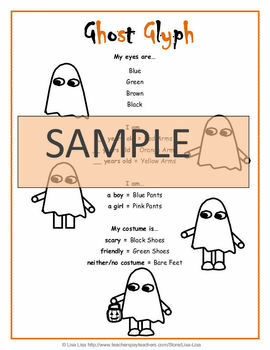 This cute little ghost trick-or-treater comes with everything you need to customize it in any way you’d like. 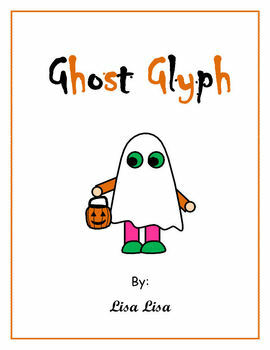 I have specifications written so each student may personalize his/her ghost's eyes, arms, legs, and shoes in meaningful ways. 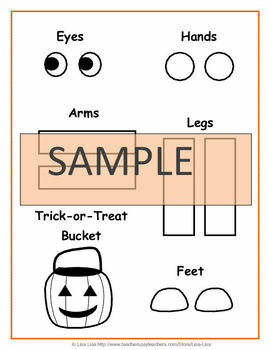 Finally, a trick-or-treat bucket is included which may be personalized however students desire. I hope you enjoy sharing this with your class and displaying their completed glyphs! Please leave feedback after purchasing, and you will earn valuable TpT credits to use toward future purchases!